Bagon in game: 3,143 Who? Important notice! Pokemon Bagon is a fictional character of humans. 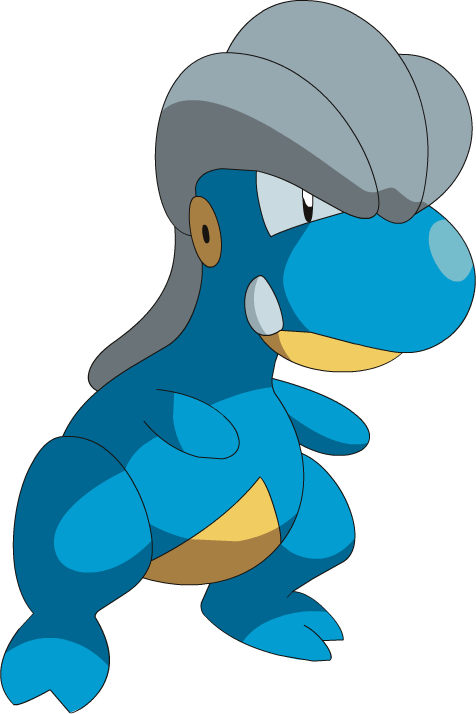 Bagon is a bipedal, blue, reptilian Pokémon vaguely resembling Pachycephalosaurus. It possesses a large, round snout, triangular eyes, yellow, circular ears similar to reptiles, and a yellow lower jaw with two teeth protruding upwards. Three thick, gray ridges cover the top of its head, and continue downwards to cover its neck as well. There is a triangular patch of yellow on its underside. It has stubby, digitless arms and short legs with two toes on each foot. Bagon lives in rough terrains with cliffs and rocks. It longs to fly and dreams of one day being able to do so. Frustrated at its inability to fly, it leaps off cliffs and smashes its head against large rocks. This process of continually bashing its head causes it to become as hard as steel. Well-developed neck muscles support its hard head. This, combined with its powerful body, allows it to shatter rocks with its head. Bagon made its anime debut in Let Bagons be Bagons, in which a Bagon, belonging to a Trainer named Michelle, tries to learn how to fly, a trait shared with a runaway Bagon in Pinch Healing. A Bagon appeared in Pinch Healing!, where it fell ill and was treated by Brock. 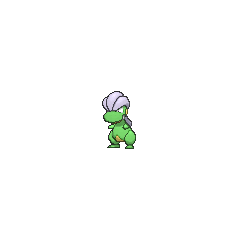 A Bagon was seen in Tag! We're It...! during the Hearthome City Tag Battle Competition, where it fought along with a Yanma against Brock's Sudowoodo and Holly's Wingull. 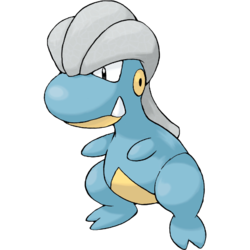 A Bagon appeared in A Fashionable Battle!, under the ownership of Sawyer. It evolved into Shelgon sometime before A Meeting of Two Journeys! and evolved again into Salamence sometime before Analysis Versus Passion!. A Bagon appeared during the Hoenn Grand Festival in Deceit and Assist. A Bagon under the ownership of a Coordinator appeared in New Plot, Odd Lot!. A Bagon appeared during the Floaroma Contest in Settling a Not-So-Old Score!. 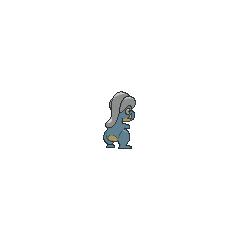 A Bagon also appeared in The Keystone Pops!. A Bagon appeared in the opening of Destiny Deoxys. 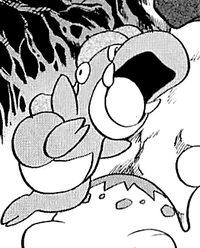 A Bagon appeared as one of the many Pokémon that grunts of Team Magma and Team Aqua sent out in the Seafloor Cavern in No Armaldo Is an Island.